Louis Kessler, an avid genealogy enthusiast of 30 years, is the mastermind behind the development of a new format for genealogical record keeping. As you know, when utilizing the standard programs for genealogy record keeping you see a family group record and pedigree. If you like documenting information of family members that are not directly related to you except through marriage, for example if you have your 2nd cousins family and their descendants in your file, it is a bit more tedious to find them in the standard genealogical format. Louis has developed a program currently in the alpha trial and soon to be released in the beta trial format that does not follow the current record keeping style. The closest format that it is possible to compare this new program to is the standard genealogical programs include the ahnentefal chart style or book format for printing. One of the many differences between "Behold" and the standard programs, is the program once Version 1 is released in will allow you to see errors and correct them on the screen as you see the error. When you import your file, you will see that the data in Behold will have a split screen with the navigation links on the side as well as in the document. Please see the picture below for an example. "Behold is different from other programs in a significant way. Yes, the Everything Report can be thought of as something like book format, but the big difference is that Behold is output-based. The primary interface to the user is the Everything Report. You don't have individual forms and tabs to navigate through to access your data. You don't have to generate your report when you want it because the primary window is the report. Right now it is just a GEDCOM browser, but my aim is towards version 2.0 when I add editing directly onto the Report. Then it will effectively become a word processor customized for your genealogy data. You will add and change your data right where you see it and there will be no need to jump back to forms to find your data to correct it and regenerate your report. I expect this innovation will save each genealogist countless hours in data entry time - simply because you see what you've entered immediately and in the context of everything else. Errors will be obvious and instantly correctable. 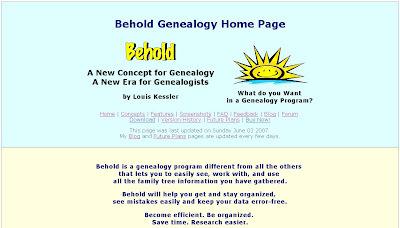 Behold's organizational tools to select, number, and display families are unique and powerful, especially the Instant Organize which with one click will produce a report including everyone related to a specific individual that you can then send to them. I've never felt the need to print standard family group sheets or pedigree reports with Behold. Nor have any of my users asked for it. With Behold, the goal is to allow you to print ALL your data about several thousand families whether related or not related and put it in a binder for hard copy reference. 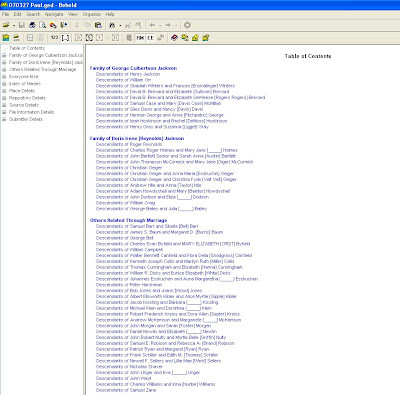 This includes all notes, all sources, references, repositories, indexes, etc. Group sheets would take several thousand pages and be impossible to navigate through to find the one you want. I really feel something new is required. I've been doing genealogy for 30 years and have always felt something better was possible than the old manual recording methods. Behold is the embodiment of these new ideas. The people who have discovered it already are quite excited by it. I've received many wonderful comments and with their permission have posted many of their testimonials on Behold's home page." I have downloaded this program and have enjoyed playing with it. It has some great features that make keeping track of all your ancestors streamlined. I love the table of contents feature and the ability you have to navigate so easily through your database. Once you purchase this program (for a nominal fee), you will receive a lifetime of updates for free. Louis is offering the genealogy community a new and innovative way to track ancestors and descendants. One that has great potential to make sharing and printing your files easier. If you are interested in checking out this new and exciting program, please click here and you will be directed to the homepage of the program "Behold". If you click this link, you will be able to look at some of the screen shots of this program. Have fun.